How To Make Puppets - Show Me WOW! they can be an intricate work of art than can take endless hours of creativity and patience. Wow! However they are made, if used within the classroom in a creative way, puppets can be immeasurably valuable in accelerating learning in many aspects of literacy. 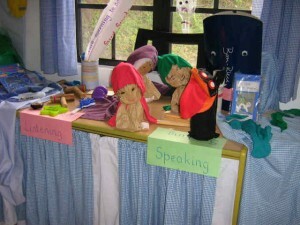 Puppets can promote listening and speaking skills leading to reading and writing. 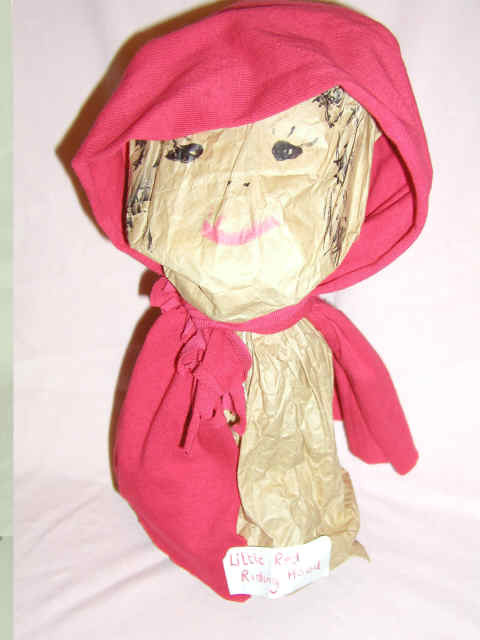 Red Riding Hood, the wood cutter and Granny made from brown paper bags and the wolf made from an old sleeve. 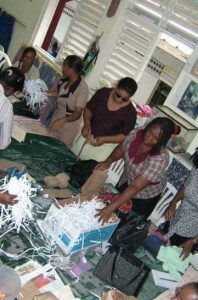 Teachers at one of Chris Lawrence’s workshops, making brown paper bag puppets ready to use in their classrooms. 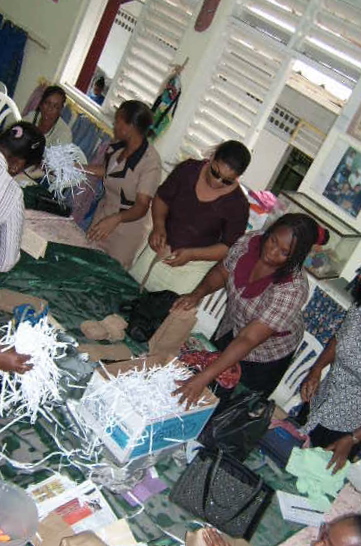 The shredded paper is used to stuff the bags. These teachers will take their puppets back to school and show the children how to make more and then the play making will begin. See bottom of this page for how to make brown paper bag puppets. 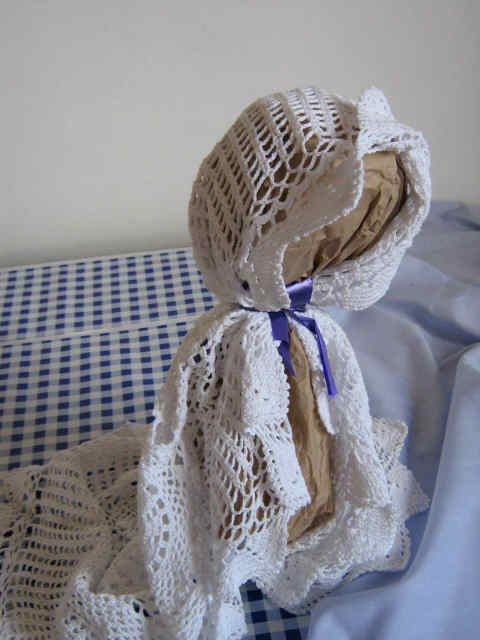 I have worked in one classroom where the teacher used a puppet, a toad called Sedgewick, as if he were another pupil. Sedgewick would show the Grade 1 children how to form a certain letter, say a letter h, and he would start at the bottom on the line. “No Sedgewick!” the children would call out. “Remember you start at the top!” How much more effective than if the teacher were reminding the children of this start-at-the-top point by just telling them. I am talking about a different level of interest, enthusiasm and concentration here now…and a different level of learning. The children took on a far deeper level of understanding for forming the letter h from Sedgewick’s mistake. Sedgewick became like a real person to the children. He was the one who was the dentist in their tooth project, sitting beside the dental chair made of a bleach bottle with its spout cut out, wearing a white coat and with his appointments book and his wooden spatulas. Tooth fairies with feather wings flying from the classroom ceiling around him were made by the children. 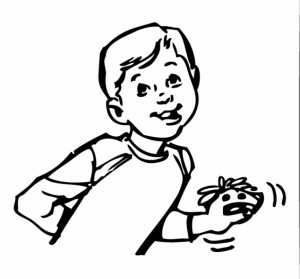 Isn’t it true the world over, that children of this age like and need a little toy character to relate to and to work out their ideas around…like imaginary friends? We should take advantage of this innate need and maybe use a class puppet like Sedgewick. 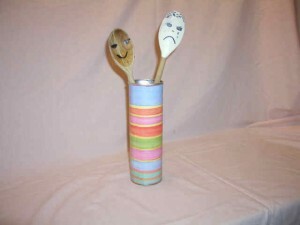 Old wooden spoons with a smiling face on one side and a sad face on the other can be used to chat about unhappiness and what can be done to turn a sad face into a smile. This can be used in bullying incidents, in squabbling upsets and in talking with a child who needs the spoon puppet as a go-between to help them have the confidence to explain things like feelings. The convention of moving from telling news or telling a well known story to converting it into a running dialogue can be quite demanding. 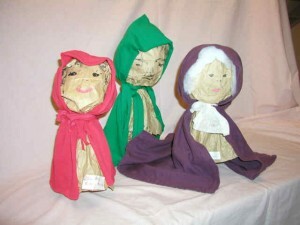 Moving a theme from one genre to another is easy when you have puppets as a teaching aid. And from the ability to create a dialogue, comes other genres like character study writing. 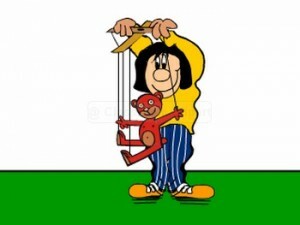 Puppets allow children to be able to take on a new persona and in so doing help them to learn the skill of being able to empathise…a skill we all need to improve on whoever and wherever we are, and whatever our age. And the performing can be done within the class, or can be done to another audience, so developing confidence skills. And stretching the literacy and cross curricular theme, there could be poster designing, ticket making, seating arranging, (Maths), etc. and reported writing after the event. I find this is unnecessary. The idea of a theatre is to hide the puppeteer I think. 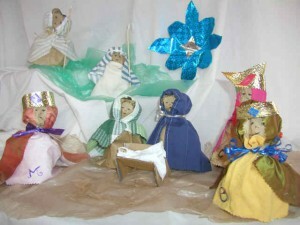 But when small children see the puppets, it seems that they do not see the puppeteer! 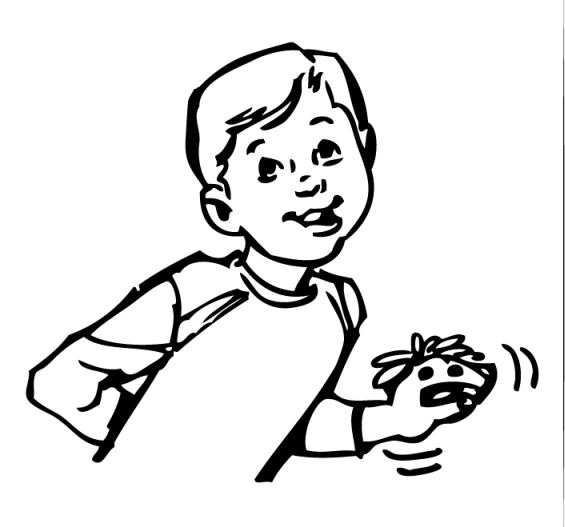 And if a child is being a puppetteer, then he likes to see what he is doing with the puppet anyway. Hiding behind a screen with his puppet covered hand up to the audience, imagining what they are seeing is often too hard a concept for him. For older children, building a puppet theatre extends the learning process in another direction and they can probably cope with hiding and performing with hand puppets. Huge cardboard boxes can be fashioned into a theatre, or a table over on its side where the table top becomes the theatre front, or a blanket on a rope washing style, between two trees. It’s just a case of being creative to make the drama more magic and more fun! At one of Chris Lawrence’s workshops, these teachers are drawing faces on their brown paper bag puppets.Once finished, they work in twos or threes improvising a dialogue between the puppets ready to then perform to the group. They are considering the character style of their puppet as they create it. Children love to do this. How to make a brown paper bag puppet in under two minutes. A brown paper bag of any size. Newspaper or shredded paper to stuff inside. String to tie round the puppet’s “neck” to keep the newspaper in. Fabric to attached round the head and tie under the chin. Coloured pens to draw the face. 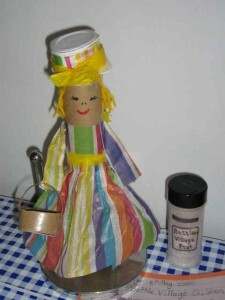 A bottle of water to stand your puppet on when it is not on someone’s hand. Just put it together and it is done! Little Red Riding Hood, her father, the woodcutter and her granny. 1) To make the pattern, place hand on paper with 3 middle fingers touching and the thumb and little finger outstretched. 2) Draw round hand and then cut out shape now on paper for the pattern. 3) Pin this paper pattern on fabric and cut out 2 pieces slightly bigger than the pattern to allow for seams…one for puppet front and one for puppet back. 4) Cut puppet front in a straight line from your centre wrist up to base of your middle finger. This opening gives better space for puppet to fit and move comfortably. 5) But the wrist, that will now be exposed by this cut, needs hiding! Do this with a rectangular piece of fabric, about 4 inches x 6 inches (10cms x 15 cms), gathered at one of the shortest edges. 7) For face, cut a round fabric shape and sew on buttons, beads, or small pieces of fabric for eyes.. or draw on face features. Add “hair” of braided sewing thread or of shredded or fringed fabric. 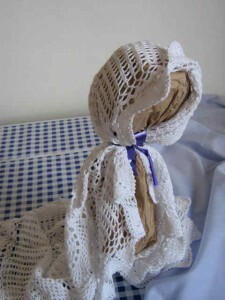 8) Attach face to front piece of puppet. 9) Add any other details like a belt, a crown. 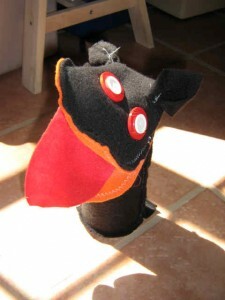 An old sleeve or tube of fabric, an oval shape for the mouth (orange here) and fabric scraps for the red tongue and the ears and buttons for eyes. 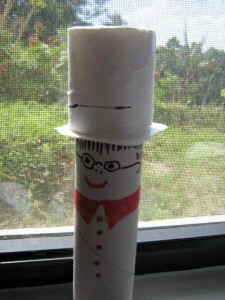 A gentleman in glasses made from a card tube for his body and cut down yogurt pot for his hat. Lady with a basket. A card tube with a cut down, yoghurt pot hat trimmed with yellow plastic from a supermarket bag, dress of tissue wrapping paper, with yellow plastic belt, hair of yellow wool, basket made of card.